Located just a few kilometres north of the coastline of North Sulawesi, the five islands that make-up the Bangka Archipelago are home to a few villages. The hills of Bangka Island have extensive farming for cashew nuts. Below the surface are amazing soft coral covered reefs with beautiful seascapes. Located close to the port of Bitung (our port of departure), Lembeh Strait is famous for its muck diving. You name a tropical critter and you can almost guarantee it can be found here. 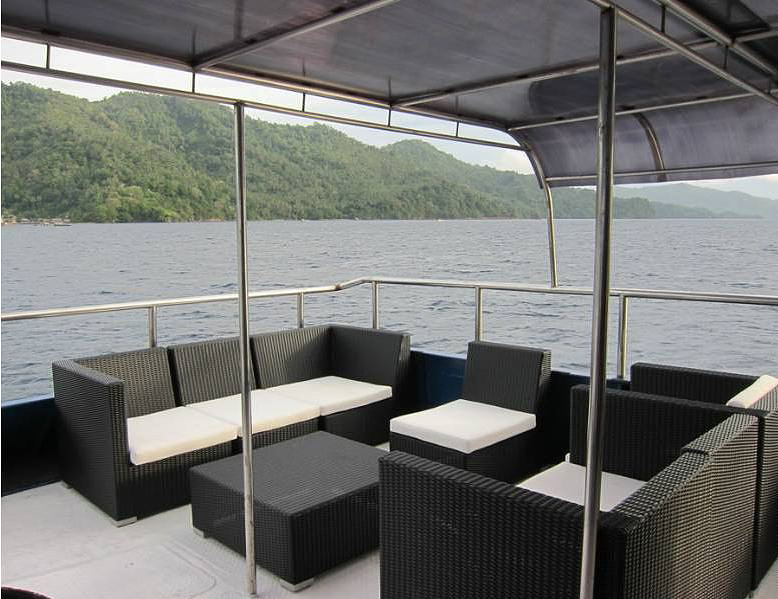 The Strait is a narrow strip of sea squeezed between Lembeh Island & the North Sulawesi mainland. 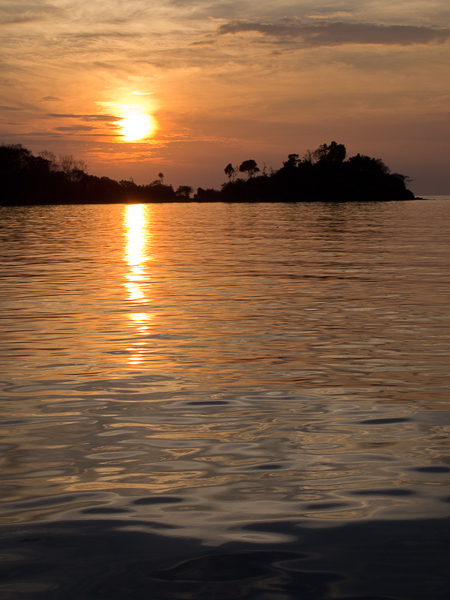 The mainland of North Sulawesi has spectacular above water scenery with varied landscapes. While underwater are muck diving sites, pinnacles, jetty's and walls. 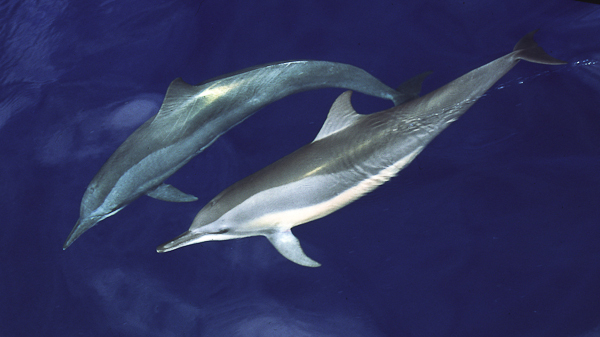 Dolphins are often sighted from the bow of the boat. Our 10 night underwater dive/photo cruise in North Sulawesi is a fantastic mix of dive sites including Lembeh Strait, the Bangka Archipelago, Bunaken Island and the coastline of North Sulawesi.We begin our journey in the port of Bitung, the entry point to Lembeh Strait, one of the World's best muck and critter diving locations. We spend a few days exploring the world class muck diving sites along with a WWII wreck in this sheltered passage between Lembeh Island and mainland Sulawesi. 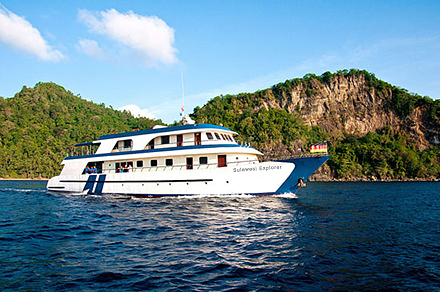 We then cruise and dive along the coast north of Lembeh Island, heading towards the Bangka Archipelago, this area has some beautiful reefs alive with colour and stunning marine life. After a few days diving around Bangka and the nearby coast of North Sulawesi, we cruise west towards Manado, stopping along the way at reefs, wrecks and muck diving sites. 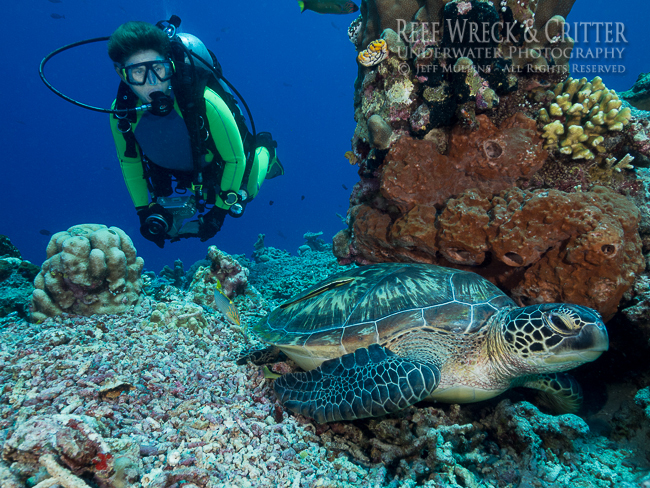 This area has some of the most varied diving we have seen; Jetties, black sand muck sites, vertical coral encrusted walls, wrecks and coral gardens. On each of these trips we are often surprised by some new rare critter discovery or some magic moments underwater that has everyone emerging from the sea with only one word to describe the dive...... "Awesome". The adventure of the unexpected is one of the great draw cards of these trips. But the things that we can guarantee are: No long boat journeys. No overnight motoring. No-one rushed to finish their dives. No-one watching you still have 50bar when you board the dive boat. We only invite experienced divers, so you won't be treated like a beginner. 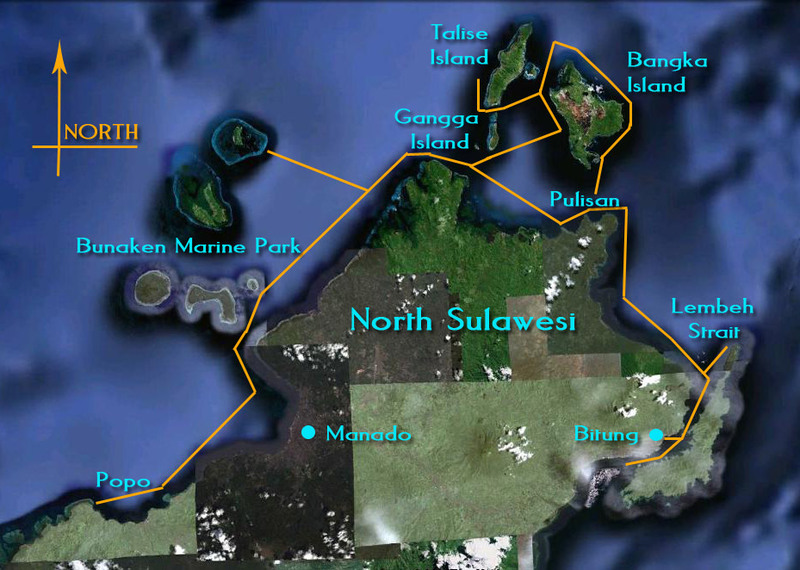 These trips are all about fun, photography, plain relaxing, diving and cruising around the islands of North Sulawesi. 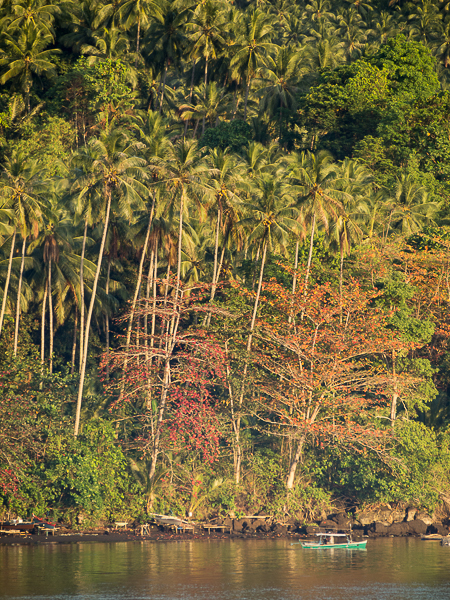 Click to read what previous guests have to say about our North Sulawesi Cruise. North Sulawesi has something to offer every underwater photo enthusiast. 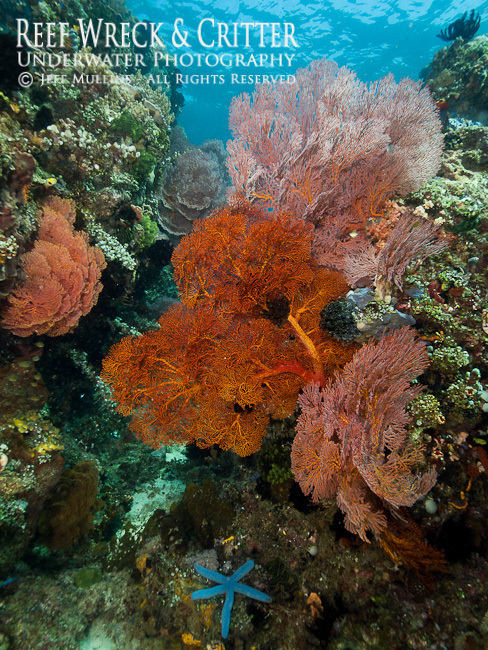 From the world-famous critter sites of Lembeh Strait to the magnificent soft coral coated pinnacles of Bangka Island. The islands and coastline of North Sulawesi will not dissappoint you. We will be cruising among the Bangka Archipelago, where we dive on volcanic pinnacles, steep walls and reefs with very rich marine life. 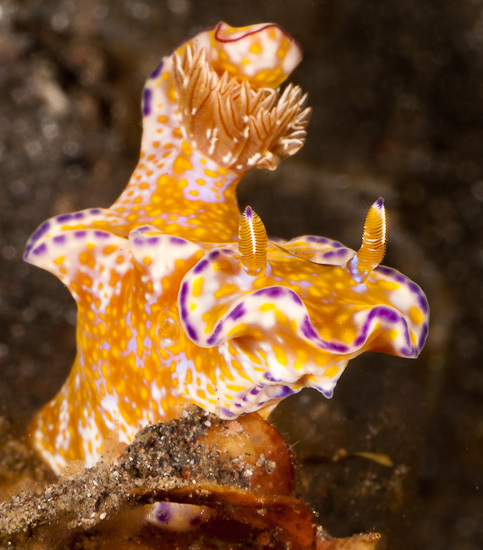 We'll cruise through Lembeh Strait and visit the critter rich sites that constantly surprise marine biologists with the rare creatures that can be found on every dive. Bring your wish-list of creatures and we will do our best to find and help you photograph them. There are WWII wrecks in Lembeh, and around the coast of North Sulawesi that we will also visit. Plus the reefs, bommies and jetty's along the coast of North Sulawesi, where we can see both macro subjects and reefs coated with beautiful corals. We also will be visiting the sheer walls of Bunaken Island to dive the area's best sites, including a wall pocked with ledges where large turtles come each evening to rest at sunset. The map (left) shows the areas we will visit. After arriving at Manado Airport, we drive to the port of Bitung to begin the cruise. We return to Manado Airport at the finish of the cruise. 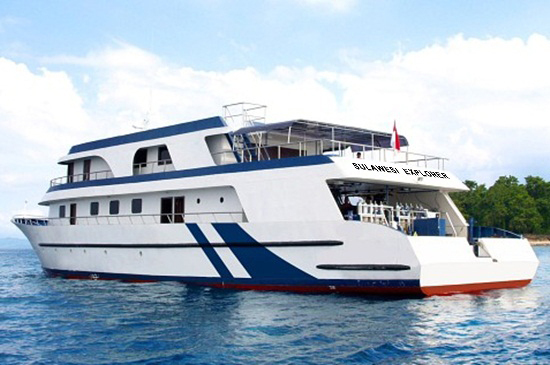 Built in 2011 in South Sulawesi, this 35 metre-long Steel Vessel is large and comfortable for moderate sized dive groups. Powered by twin Caterpillar diesel motors, with a cruising speed of 13 knots. This is a large modern vessel with all inside areas air conditioned, plus cabins all have individual air conditioning. There are 9 guests cabins on three deck levels each with their own toilet/shower. Three cabins are located on the two upper decks (one twin and two doubles), 4 twin cabins are located on the lower deck, with two single cabins also on the lower deck. All twin cabins have single beds (not bunks). There is also a large saloon area, as well as a huge dining area, and a spacious sun deck . We will have a maximum of 13 guests onboard. So crowding is not a problem. The rear deck dive preparation area is huge and has individual stations for each diver. The boat is also equipped with GPS navigation, depth sounder and radar. All this along with a friendly local crew who know the islands and their waters intimately, will make this trip pure pleasure for experienced divers and underwater photographers.